Wiggle Waggle Whiskers is a cute version of the dots and lines game you played as a kid. The goal is to fully fence in as many spots on the board to keep your kitten or puppies safe. Intended for only two players, this children's game is great for one on one time with a parent, sibling or friend. 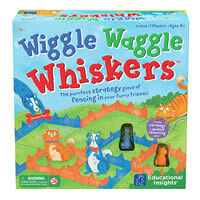 Complicated rules are not part of Wiggle Waggle Whiskers and the rules couldn't be more simple. The fun graphics and childish figurines are great for kids. They will love how they can complete squares to win. Counting up the score is also easy. Give this game as a gift and the recipient will be glad you did. Close the most squares on the board to claim the most space for your kittens or puppies. You'll get a game board, 20 puppies, 20 kittens, 24 blue fence pieces, 24 orange fence pieces and the official Wiggle Waggle Whiskers game rules and instructions. Please keep in mind that the official Wiggle Waggle Whiskers childrens rules and instructions could be different depending on the game version you have. The rules below are some of the exact directions on how to play Wiggle Waggle Whiskers. Share with us your comments, funny stories, tips, advice, strategies, creative ways to play, questions about how to play, problems with the rules or anything you want about Wiggle Waggle Whiskers. All submissions will be reviewed within 24 hours. Click here to add your Wiggle Waggle Whiskers comments.